One skill that seems to be essential in almost every layout is the art of layering. Choosing the right combination of paper or other materials and layering them just right for a certain look can be a challenge. Something that I have learned is that you just have to be willing to take the time to try a lot of different things to get it just right. 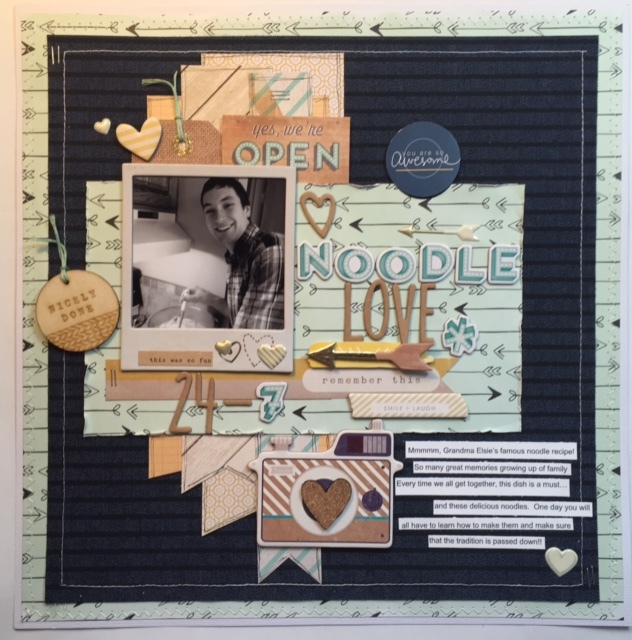 Don’t be afraid to use other scrappers’ layouts for inspiration. This is a great way to start to learn. Once you have watched people do their layering, you slowly get to be more confident and are more able to sort it out for yourself. Another great idea is to use a sketch. There are tons of sketches out there on social media. One great resource is Pinterest. Pinterest is easy to use and full of great ideas. There is a link to my Pinterest boards up to the right on this page. My Project Life/Scrapbooking board is full of ideas, including sketches. This was a fun layout with some layering. I used some long, narrow pieces behind the photo layer and cut them into banners. I off set them to create the layer behind the longer horizontal photo layer. This creates a base for the layout and encourages the eye to focus in the center, which is where the photo rests. I love how this turned out!